In spite of being quite expensive when compared to other kitchen countertops, slate countertops do add style and elegance to any kitchen space. Another reason for their increasing popularity is the fact that they require just a low maintenance and care provided that all the necessary initial precautions where taken when installing the slate countertop. 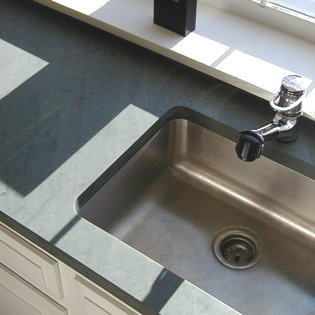 Here are some easy to follow pieces of advice regarding slate countertop cleaning. First, you have to make sure that you clean your slate countertop once a week by using a micro fiber cloth. This is likely to be sufficient in order to keep your slate countertop clean. Next, while installing your slate countertop, you will have to make sure that you seal it in the right way mainly because a sealer is going to slow down the future process of soaking all the spills that are common in a kitchen space. Secondly, you will have to wipe the slate countertop by using a damp rag in order to prevent grime and dust from depositing on its surface. Do this on a daily basis. Once you notice that there are scratches on your slate countertop, you will have to sand each of them by using fine quality sandpaper. You will have to even out the affected surface soon after removing all the scratches and you can do this by using the same sandpaper. Make sure that you reapply quality sealer after each sanding. Spills must be cleaned immediately especially the ones coming from all sorts of acid based foods such as tomato or lime. Also, the spills from dark colored drinks and foods are to be cleaned immediately as well in order to prevent any stains from appearing. Make sure that you blot the spill and not wipe it. Also, you will have to use a pH neutral cleaner that is especially designed for natural stone cleaning. For instance, you must avoid using acidic cleaners such as lemon or white vinegar on your slate countertop because such cleaners can easily etch its surface. Once you notice a stain on your slate countertop, you will have to clean it by using a poultice especially designed for natural stone kitchen countertops, especially if you are dealing with gravy and sauce stains. Steel wool and abrasive cleaners must not be used on your slate countertop as they can lead to severe scratches on its surface. If there are any stains on your slate countertop resulting from grease, cream, milk, oil or butter, you will have to add hydrogen peroxide with flour in order to make a paste that is to be applied right over the stain. Next, you will have to cover the stained area with plastic. Let it stand overnight and remove all the plastic in the morning. Then, wipe away the paste and continue by using a flexible, soft scraper or a cardboard in order to remove all the remaining cleaning paste. Do not use a metal scraper as it can scratch the surface of your slate countertop. Even if slate countertops are quite resistant to stains, you will have to seal your slate countertop on a regular basis. Resealing is essential as well. Once you notice that the water drops splashed on its surface don’t make any beads, you should know that it’s high time for you to reseal your slate countertop.